More than 22 million people suffer from heart failure worldwide with approximately one million new patients diagnosed annually. In the setting of an aging global population, heart failure is the number one reason for hospitalization. The most severely ill patients need heart transplants in order to recover. More than 8,000 people worldwide are on the list of eligible candidates for heart transplants annually, but less than 3,000 receive a transplant each year. A large number of people who suffer from severe heart failure do not qualify for transplantation due to other health issues. An alternative for these patients is access to artificial mechanical assist. A Left Ventricular Assist Device or LVAD is a surgically implanted mechanical device that helps the heart pump blood. In other words, they are “heart pumps” or “heart assist devices.” If both your heart’s pumping chambers are failing, 2 heart pumps may be used, one for each ventricle. 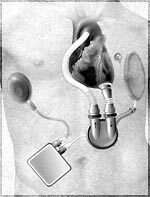 An LVAD either takes over or assists the pumping role of the left ventricle – the heart’s main pumping chamber. Newer LVADs are meant to be permanent in people with severe heart failure. Part of the device is implanted in your heart and abdomen, and part remains outside your body. You carry the external part of the device on a belt around your waist or on a shoulder strap. Most LVADs right now have an electric pump, an electronic controller, an energy supply (usually a battery weighing about 8 pounds) and 2 tubes. One tube carries blood from your left ventricle into the device. The other tube takes blood pumped from the device into your aorta (artery) to be circulated throughout your body. Terumo Heart, Inc., announced this week that another patient implanted with the DuraHeart™ Left Ventricular Assist System (LVAS) has surpassed four years after receiving the mechanical circulatory support device. Helga Gieseke, 66, who lives in the south of Saxony-Anhalt, Germany is now one of the longest-living heart failure recipients of this device designed to aid the pumping action of the heart in order to circulate blood throughout her body. Mrs. Gieseke received the DuraHeart LVAS as an investigational device in May of 2006 after suffering from heart failure for many years. She was treated by the Physicians at The Deutsches Herzzentrum Berlin as part of the DuraHeart LVAS clinical study that ultimately lead to CE Mark and commercialization in Europe. Mrs. Gieseke has had a long history of heart problems; her first heart surgery was performed in 1994. Since then, Mrs. Gieseke had undergone several procedures including implantation of stents, pacemakers and implantable defibrillators in an attempt to manage her condition. Despite all these treatments, Mrs Gieseke’s condition continued to deteriorate until she found herself unable to walk or carry out simple activities around the house without getting chest pain. It was after admission to the local hospital in April of 2006 that Mrs. Gieseke was told by her cardiologist, also a school friend, that she required additional treatment. It was then that she was referred to The Deutsches Herzzentrum Berlin. The DuraHeart LVAS can be used as a bridge to heart transplant in patients with end stage heart failure. Due to the scarcity of donor organs, patients can sometimes be on the waiting list for many months until a suitable donor becomes available. During that time, a patient’s condition can deteriorate dramatically until no other alternative is available to them. The left ventricular assist systems offer the patient a second chance while waiting for a suitable donor. The DuraHeart LVAS is currently being studied in the DuraHeart Pivotal U.S. Trial for Bridge-to-Transplant (BTT), a multi-center, prospective, non-randomized study, involving 140 patients. The study, which granted unconditional approval in early 2010 by the U.S Food & Drug Administration (FDA), will evaluate the safety and efficacy of the device in helping to sustain patients awaiting heart transplant who are at risk of death due to end-stage heart failure. For more detailed information about the DuraHeart BTT Trial, visit www.clinicaltrials.gov, and for more information about the DuraHeart LVAS, visit www.terumoheart.com.